MODBASE contains theoretically calculated models, not experimentally determined structures. The models may contain significant errors. ModBase is a database of comparative protein structure models, calculated by our modeling pipeline ModPipe. To include the academic (comprehensive) dataset, go to Current Datasets! This page makes all models and model details for one sequence available. Additional models are accessible through their thumbnails. 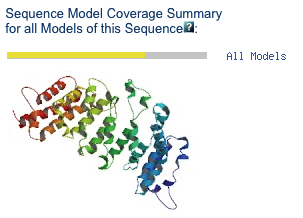 Models for several sequences are displayed on the Sequence Overview page. The sketch also links to the Model Details page. 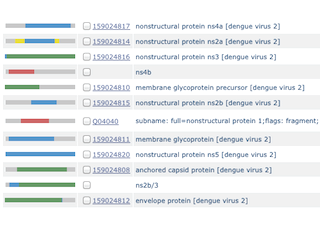 MODBASE, a database of annotated comparative protein structure models and associated resources. Ursula Pieper, Benjamin M. Webb, Guang Qiang Dong, Dina Schneidman-Duhovny, Hao Fan, Seung Joong Kim, Natalia Khuri, Yannick G. Spill, Patrick Weinkam, Michal Hammel, John A. Tainer, Michael Nilges, Andrej Sali Nucleic Acids Research 42, D336-46, 2014. MODBASE is maintained by Ben Webb in the group of Andrej Sali, Department of Bioengineering and Therapeutic Sciences and California Institute for Quantitative Biomedical Research, Mission Bay Campus, Byers Hall, University of California San Francisco, San Francisco, CA 94143. Please address all inquiries to .